The first time I saw Arnold Schwarzenegger was while watching Terminator with my father. When the terminator came ion the screen, my father pointed at him and told me “This actor? This is the world’s champion in bodybuilding”. Of course, an athletic person going into movies is not that surprising, happens all the time with football and basketball players. An Austrian champion bodybuilder becoming a movie star then becoming the governor of the state of California in the USA, is worth reading about. I loved the beginning of this book, how Arnold was born in a year of famine, how they lived in bare necessities, how he had strong parents who disciplined him yet a father who didn’t believe in him. Defiance is very present in the first chapters of the book and throughout. How the little boy had a dream and he worked relentlessly to make it happen and worked harder whenever someone laughed his dream off or told him it cannot happen. His commitment, his punctuality, defiance, determination, and steel will got him his many bodybuilding titles and helped put the bodybuilding on the map and got him to America and gave him his first business of bodybuilding videos, tips, and supplies mail order. Then the book talks about his American life and doesn’t much talk about his relationship with women then you turn a page and find him talking about falling in love with a Kennedy and marrying her and having children. The book, even though it talks about his family life after marriage, is still on the private side. You cannot sense much gooey emotions but you can definitely sense a strong will and determination to put a mark on this world and change it to the better. 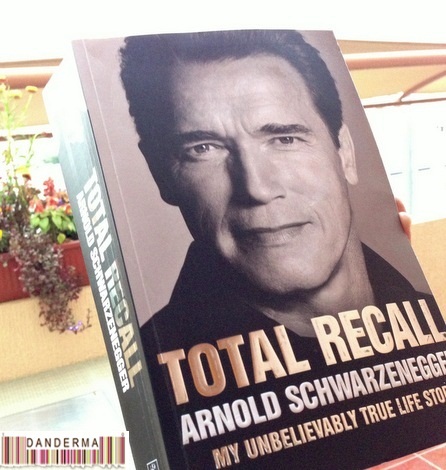 Then the book progresses into the movie parts of Arnold’s life, which was fun to read, then the politics part. In the politics part we see a side of Arnold that is so private that he didn’t inform his wife of his wanting to run for governor or the people of California until the last-minute. The man is like a machine that works silently with Austrian efficiency! I, however, hated the part about Arnold’s secret affair with the housekeeper that resulted in him fathering a son who’se as old as his youngest son from his wife. His, lets say, explanation is too casual and after a long book filled with details, its just not enough or that convincing. Overall, the book is an inspiration for how to achieve what you want in life even if all the odds were against you. I can identify with that and I think I’m going to listen to Arnold’s dream-to-reality transformation tips. After all, he made, didn’t he? Defienetly going on my bookshelf and I would strongly recommend it.